Route 2 and Route 6: Follow Routes 2 and 6 north to the traffic light at the intersection with the I-95 Connector Road (River Road) and Penobscot Valley Avenue. 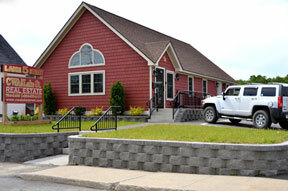 (Machias Savings Bank is on the corner of Route 2 and Penobscot Valley Avenue). Come straight through the traffic light on Routes 2 and 6 (a/k/a West Broadway) for 1.5 miles (straight through a set of lights at Lincoln Shopping Plaza) to the lights at the south end of Main Street. you are now looking out at scenic Mattanawcook Lake.Turn left onto Main Street and go about 250' to Lake Street. Turn right onto Lake Street. We are your first building on your right. I-95: Take I-95 north to Exit #227 (Lincoln/Mattawamkeag Exit). At the end of the off ramp, turn right onto River Road and go 3.7 miles (going through the intersection with Route #116 and across the Penobscot RIver) to the traffic light at the intersection with Routes 2 and 6 (a/k/a West Broadway). Turn left onto West Broadway and go 1.5 miles (straight through a set of lights at Lincoln Shopping Plaza) to the lights at the south end of Main Street. you are now looking out at scenic Mattanawcook Lake.Turn left onto Main Street and go about 250' to Lake Street. Turn right onto Lake Street. We are your first building on your right. Route 155: From Enfield on Route 155. At the intersection of Route 188 and Route 155 in Enfield Village, go north on Route 155 for 8.2 miles to the lights at the south end of Main Street in Lincoln. Go straight through the lights for about 250' and turn right onto Lake Street. We are your first building on your right. Route 2: Follow Route 2 south to the lights at the north end of Main Street in Lincoln. (You are between Worcester Brothers-DOC and Thornton Brothers Dodge-Chrysler). Continue straight up Main Street for .3 miles to Lake Street. Turn left onto Lake Street (this is your last left before the lights at the south end of Main Street). We are the first building on your right. I-95: Take I-95 south to Exit 227 (Lincoln/Mattawamkeag Exit). At the end of the off ramp turn left onto River Road. Take River Road for 3.9 miles (going through the intersection with Route #116 and across the Penobscot River) to the traffic light at the intersection with Routes 2 and 6 (a/k/a West Broadway). Turn left onto West Broadway and go 1.5 miles (straight through a set of lights at Lincoln Shopping Plaza) to the lights at the south end of Main Street. you are now looking out at scenic Mattanawcook Lake.Turn left onto Main Street and go about 250' to Lake Street. Turn right onto Lake Street. We are your first building on your right. Take Route 6 to the intersection with Lincoln's Main Street (at the monument). Turn left onto Main Street and go .15 miles to Lake Street. Turn left onto Lake Street and we are the first building on your right.